William Connor was born on 9th May 1881, 5 Fortingale Street, which ran from Agnes Street to the Old Lodge Road, Belfast. One of six children, five sons and one daughter his parents were William and Mary Connor Nee Wallace. 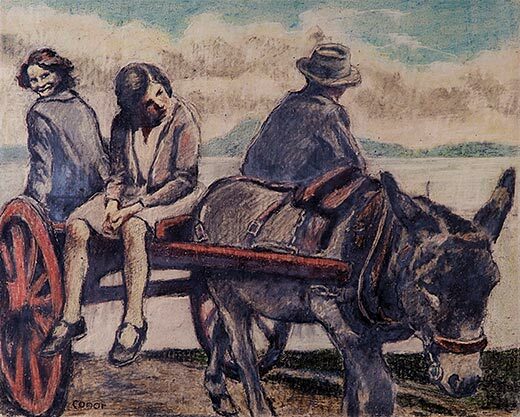 Williams talent was first noticed at the age of ten when his chalk drawings on slate attracted the attention of his music teacher at school who encouraged him to attend the Belfast Art College. William was often seen in and around the Shankill area leaning on lamp posts or shop fronts sketching the local people going about their daily routines. He loved to capture the clothing and the facial expressions of those around him, during the early part of the twentieth century. Conor would sketch on anything he could find, sometimes it was a newspaper or if he was lucky a scrap of plain brown paper. 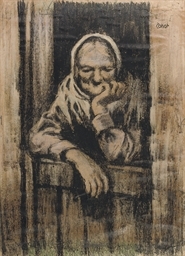 He would use ink, pencil or a piece of charcoal and would later transfer them to oil and board when he could afford it. On the outset of the First World War William was commissioned by the British Government to record, through his work the life of the British soldier and the local people. Working in the factories making munitions and other goods in contribution to the war effort, through this work William became known as the peoples’ painter. After the war Williams work was compared to the great L S Lowry, of Matchstick Men fame. Conor was awarded the O.B.E in 1952, just one of his many awards and titles . Today Williams work can fetch upwards of £50,000 for a painting and a 6 x 4 sketch on newspaper can fetch around the £800 mark. Over 50 of his Art Works are on show at the Ulster Museum. William died of hypothermia after falling at his home in Salisbury Avenue in Belfast on 5th February 1968 and is laid to rest at Carnmoney Cemetery.